I listen to By the Book, a podcast hosted by two women who read and live by self-help books for two weeks at a time and then talk about it on their show. It's hilarious! They haven't done this book, but many of their fans have mentioned it in their Facebook community. 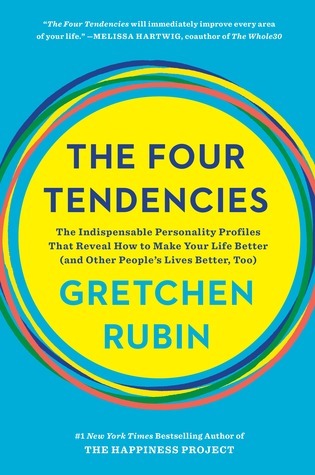 I'm familiar with Gretchen Rubin because I used to read her Happiness Project blog back before she ever got a book deal (although I stopped when I had had enough of the relentless pursuit of happiness), and I'm always interested in understanding personality types. So I thought this might be helpful. 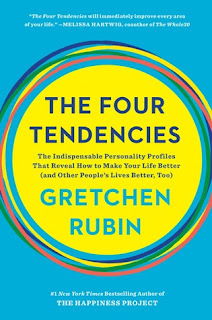 Rubin has boiled people down to four basic types, or tendencies as she calls them, according to how they meet expectations from themselves and others. Upholders meet both inner and outer expectations; Questioners meet inner, but not outer, expectations; Obligers meet outer, but not inner, expectations; and Rebels basically refuse to meet any expectations. What this means in practical terms is that, for example, Obligers will be dependable at meeting deadlines set by their boss but may struggle to go to the gym regularly. However, if they have a gym buddy they're supposed to go with, they'll go because they won't want to let that other person down. According to Rubin, most people are Obligers. Questioners need reasons for what they do, so they don't meet expectations from others unless they are themselves convinced that it makes sense. They also tend to be the people who will research something to death before making a decision about it. Upholders regularly meet inner and outer expectations. They are rule-followers who tend to form new habits fairly easily. Rebels are the opposite - they are all about freedom and doing whatever they want in the moment, resisting expectations from themselves as much as they resist expectations from others. If you know me at all, you'll immediately recognize me as an Upholder, which as far as I can tell, is the very best tendency. I may be biased. We are the ones who are often accused of being rigid. It's true that I like to have a plan and stick to it, even if that plan is going home and putting on my pajamas at 7pm and reading all evening. That is just as legit as what someone else wants me to do. But I'm super grateful that I happen to find my own expectations just as important as the expectations of others - I rarely, if ever, fall into the trap of saying "yes" too much until my plate is too full and I'm overwhelmed. I also do tend to form habits fairly easily and stick to plans, though I have recently gotten better at allowing myself to drop things when I no longer think they're helpful or relevant. In case you're wondering, my husband is most definitely a Rebel and according to Rubin, the Upholder/Rebel pairing is pretty much the worst combination of tendencies to have in a relationship. So there you have it. Obviously, not everyone in each category is the same, and there is overlap. (I think I have a little bit of Questioner, for example.) Plus of course, people have other aspects of their personalities that can dilute or mitigate their tendencies. But what I like about this, and other personality-sorting such as the Enneagram, is that it's a tool to take a closer look at why people do the things the they do and act the way they act. In terms of interpersonal relationships, I find it very useful to look at people in different ways. I'm a manager and of course I immediately tried to sort people in my department into categories, although to be honest, these categories are just giving me names for things I already knew about them. (And I thank my lucky stars I don't have to supervise any Rebels.) But for people I don't know as well, it might actually be helpful in figuring out their motivations. This kind of personality analysis is also helpful in understanding oneself too, of course. Upholders are a pretty small group, apparently, and I definitely fall into the trap Rubin (also an Upholder) mentioned, in which I don't understand why people can't just do the thing they've said they want to do, or are expected to do. Just do it! Do the thing! Do all of the things! Make a list and follow it! Yeah, that's apparently not how most people operate, so I need to realize that I'm actually the weirdo in sticking to things I've decided I want or need to do, sometimes regardless of whether it even still makes sense. Although I found this book fairly interesting and helpful at the beginning, the long sections devoted to each type were a bit bloated and I got especially bogged down during Obliger. It got very repetitive - how many times must you repeat that Obligers meet outer expectations but not inner expectations? It felt like this fairly short book would have been better as a lengthy article. But maybe it's just because I'm not invested enough in the idea that I need such thorough explanations and numerous examples. If you're interested in learning your own tendency (though you may already recognize it from my descriptions above) you can take the quiz here.